London: The Folio Society The Letterpress Shakespeare is a landmark in publishing history produced with the finest materials. Shakespeare's text magnificently printed letterpress in large-format, half-bound in Nigerian goatskin, blocked in gold with hand-marbled paper sides, gilded top edge and ribbon marker. Book measures 14" x 10-3/4". Set in 16pt Monotype Baskerville, printed on mould-made paper. Individually numbered on a special limitation page. Recessed into the solander case alongside the primary leather-bound volume is a buckram-bound companion volume from the authoritative Oxford Univeristy Press edition, edited by the eminent Shakespeare scholar Stanley Wells, which includes the text of the play with full explanatory notes. Both volumes presented in a buckram-bound solander box with leather spine label titled in gilt, measuring 15" x 11". 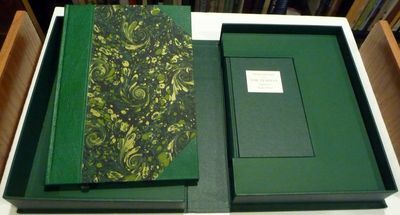 This beautiful edtion represents the most magnificent publishing venture ever undertaken by The Folio Society. Book and companion volume both as new. Solander case is fine, tight and sound. Offered at the original publication price. [Please note: No international shipping on this item. Standard shipping in the US at our normal rate, Priority shipping $45.00]. Limited Edition. Half-Leather. As New.